Stories. We love them. They’re our most ancient form of education. And yet there’s often a mismatch between the stories we love to read to children and the way the world actually works. A causes B, and B causes C. End of story. That wriggled and wriggled and tickled inside her. But I don’t know why she swallowed the fly! Ok. So it’s not A →B→C, but A→ B→ C → D→ E→ F → G. End of story. The story is dark, hilarious and a one-way pattern of connection, that is, a long, straight chain of events. Many things in a child’s life do happen in a straight line of cause-and-effect: turn up the volume on the TV and the sound increases. A causes B. Done. But cause-and-effect is not always straight. Indeed it can be loopy, web-like, cascading. (Hang in with me now. We’re going to enter the field of systems thinking. It may sound abstract but it is really practical stuff that is leading the way to solving some of the world’s most pressing problems*). 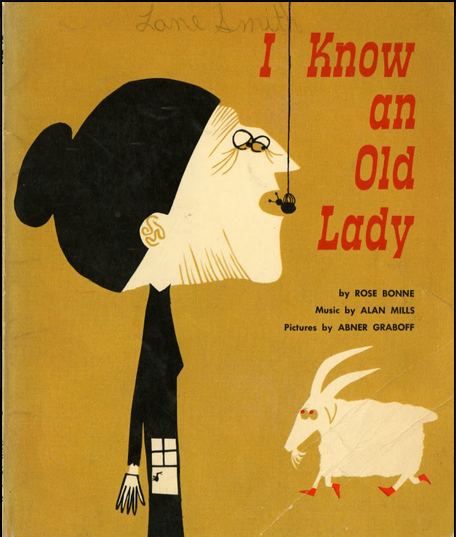 Unlike the Old Lady who swallowed that fly, this closed loop of cause and effect, feedsback on itself to amplify change. 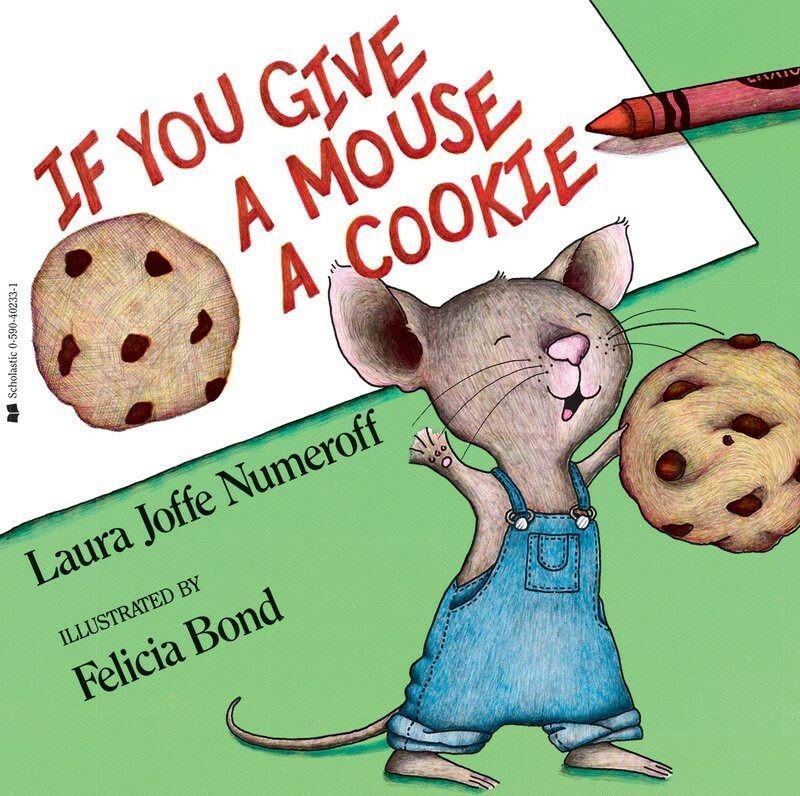 Even the youngest readers intuitively know that the story could go on forever and if left unchecked, the mouse is going to want more and more cookies. 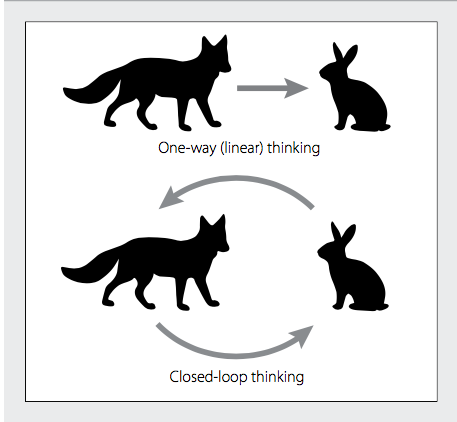 When we understand how reinforcing feedback loops work, for example, we see how events build on one another — and how a small change can “grow” into larger and larger consequences as the pattern of connections loops and loops around. Children encounter these reinforcing feedback loops everyday. Think of mean words on a playground, rising noise levels on the bus ride home or the spread of a rumor. 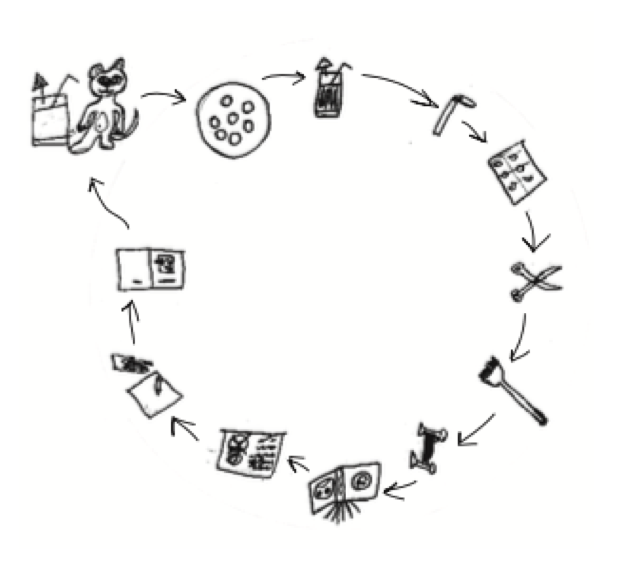 Young children can learn to “close the loop” and take advantage of reinforcing feedback. Think about saving money in the bank. It doesn’t take a math whiz to appreciate compound interest, which Albert Einstein once called “the most powerful force in the universe”: An increase in the amount of money in the bank increases interest payments. An increase in the interest payments compounds the initial increase of the amount of a child has in the bank. It’s not a far leap for kids to harness that same time of reinforcing feedback to grow, for instance, kindness in the classroom. While reinforcing feedback loops act as engines of growth and decline, another closed loop of cause and effect — balancing loops — self-regulate and dampen change. By its very nature, balancing feedback works to brings things to a desired state and keep them there. Sometimes this is good (e.g. helping to keep a system in balance) and sometimes this is why we feel stuck. When we understand balancing feedback, we understand that predator-prey relationships in nature are not one-way (where the predator simply eats the prey), but rather is made up of a closed loop of cause and effect, with births and deaths of one species affects the population of the other. A child who understand the basic idea of balancing feedback has a better understanding why things get stuck, and what they can they do about it. Let’s use the example of a messy room and a child that is doesn’t want to clean it. Throughout the week, the parent may reminds him: clean up your room! The child on the other hand, is otherwise occupied. By the end of the week, the parent’s frustration is boiling over. Finally, the parent threatens a week of no TV or depending on the age, no cell phone and the child relents. When he shows his clean room, the parent is happy. But the next day, with the pressure off, he slowly reverts to his old habits and the room becomes messy again. Mid-way through the week, the parent’s frustration builds again, this time with more pressure. The room clean up roller coaster continues. Back to children’s stories. Don’t get me wrong. I love stories with all kinds of plot lines. I’ve written two myself. But a diet of all one-way plots doesn’t prepare our children for the diversity of real world patterns they will encounter. Encourage your little readers to be pattern detectives. Encourage them to draw the patterns they see in stories. Then look beyond books to the cause-and-effect patterns they see on the playground, around the dinner table or on the front page of the newspaper. By seeing these patterns, they will be more likely to stop jumping to blame a single cause for the challenges they encounter be curious about the multiple, interacting forces driving events and often, unintended impacts. As an added bonus, when children (and adults for that matter) see patterns, they are more likely to be able to understand them and when needed, to change them. (For an example with two siblings, read here). o What happens next? (Keep asking. Sometimes you’ll find a drives b which drives c which loops back to drive more or less of a). o How is this similar pattern similar to that? When they get older recognizing these patterns helps build a bridge between different disciplines in school. Bridging science and social studies they might ask: How is the growth of the bacteria we’re looking at through the microscope similar to the population growth in a particular region? 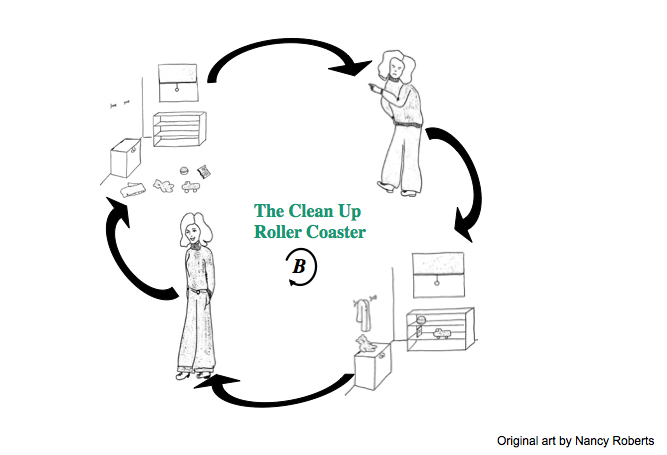 Whether we are 7 or 77, when we are aware of these closed loops of cause and effect, we are less likely to react to behaviors produced by them and more likely to be able to understand them and when needed, to change them. For an introduction to systems-based stories for little systems thinkers, see the 2018 version of When a Butterfly Sneezes: A Guide for Helping Kids Explore Interconnections in Our World Through Favorite Children’s Stories (2018, updated and revised with a new introduction by Peter Senge). 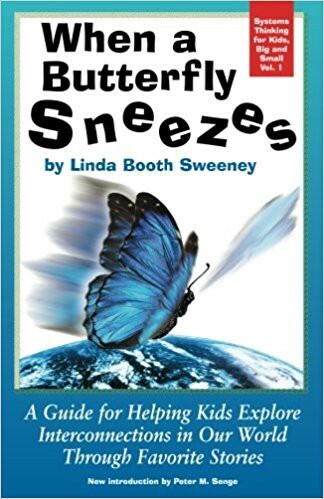 For more on systems thinking, see: www.lindaboothsweeney.com. Systems Thinking in World folktales: see Connected Wisdom: Living Stories about Living Systems by L. Booth Sweeney. Causality in science: see the Causal patterns in science work of the Harvard Graduate School of Education. 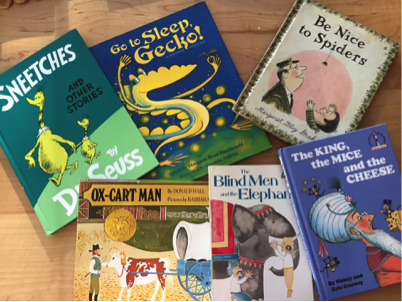 Causality in children’s nonfiction: see author Melissa Stewart’s blog Celebrate Science (look for “cause and effect” books). THANK YOU to Gale Pryor, Penny Noyce, Emily Rubin, Melissa Tackling , Eugene Pool and Christine Abely for your thoughtful feedback on this article. My early years working for Outward Bound (in New York City!) showed me first-hand, the power of experiential learning. You want to understand what it takes to lead? See what you do when a group needs to get up and over a wall, or get from point A to point B with only a compass. What role do you play? Do you support? Lead? By-stand? Play devil’s advocate? After taking part in Outward Bound courses and leading many people — from teens to executives through Outward Bound activities, it was clear: the activities helped us all to become students of our own behaviors. After leaving Outward Bound, I began my master’s at Harvard’s Graduate School of Education and began working for Peter Senge and the Society for Organizational Learning, then at MIT. I remember going home to tell my father, a very open-minded business leader, all about systems thinking. His eyes glazed over. It all sounds so heady and abstract. At that moment, the Syst ems Thinking Playbook was born. Why couldn’t I take what I learned from Outward and use experiential learning to make the concepts of systems thinking more accessible? With the invaluable support of Sheryl Erickson, I published the first volume of the Systems Thinking Playbook in 1995. Dennis Meadows, a systems dynamicist who shared my passion for experiential learning joined me as co-author for volume two and three of the Playbook. Fast forward 20 years, the Playbook carries on, the little red book that could. I’m happy to announce today that a new, climate version of the book — The Climate Change Playbook — will be released by Chelsea Green at the end of the month. Dennis and I have been joined on this book by the brilliant Gillian Martin Mehers, founder and CEO of Bright Green Learning. is for people who want to teach about or better understand complex systems. The Climate Change Playbook is for those who wish to communicate with others — from a systems perspective — about climate change. The Climate Change Playbook is focused on learning about the social and in some cases physical (bathtub game etc.) aspects of climate change. The framing and debriefing is focused on Climate Change. 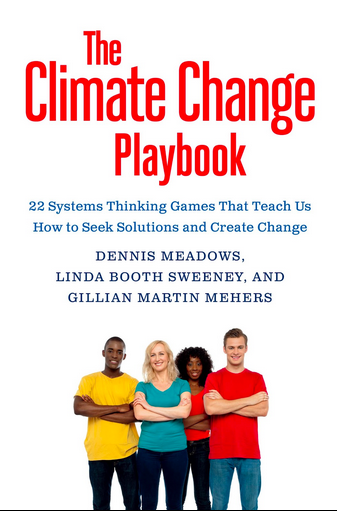 The Climate Change Playbook has several new games and the game mechanics in some games are different as the way we run them today has evolved in some cases from experience and trainer preferences. You can order the Climate Change Playbook here.